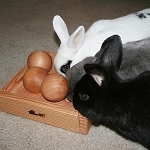 Magnus has 4 treat recesses that challenge your rabbit to lift each lid in order to reveal its prize. Watching your rabbit puzzle it out, make the connection, and be rewarded with a treat is enthralling. Magnus comes with a small bag of Bunny Bites, which fit neatly into the recesses. I don't know who enjoys this toy more. My bunsters or me watching them playing with it. My smartest bun had it figured out in a couple hours (I kinda had a feeling Twitch would) and now happily tosses the lids around for fun. The Diva will come in and eat after he opens them first for her. But she will open it herself if he hasn't opened the one with her favorite treats yet. My Bunsters highly recommend! My rabbits love this toy! They enjoy pulling and throwing the plugs around as well. They also know that when this toy comes out, they are getting some treats! Great fun for them! I have two bunnies and they both go straight for the toy when they're let out of their enclosure. They seem to love it. Unfortunately, the smart of the two does the tugging whereas the other will steal the treats. Either way it is cute to watch. Our bunnies figured out the trick the first time we put it in front of them so now the fun is in figuring out in which of the 4 wells the treats are hiding! My only complaint is that the wells are *just* too small for one of our Flemish giant rescues to get their faces into easily so they struggle a bit to get the treats out; our other bunns have narrower faces and sometimes steal his treat. 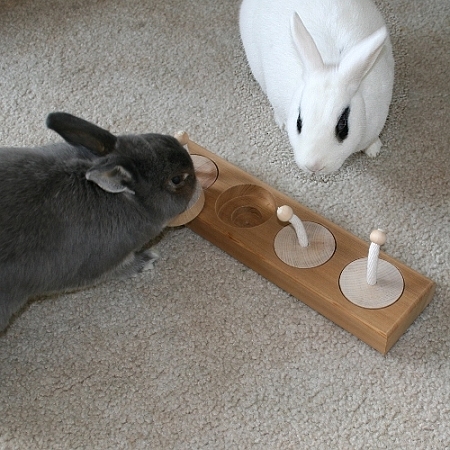 My rabbits were curious about the IQ toy, but only one of them was able to figure it out. She pulled the knobs off, and little brother came along later and ate the food. My oldest bunny never has figured it out, but at least it is there as a curiosity. Both bunnies have loved it from day 1 and always love when I bring it out. Generally I use bulk-bought craisins, but bunny bites work just as well when I have them. At first I would put treats in each spot, but now I challenge them by only filling one and letting them take turns to figure out where they are. Nibbles has started to get it and sniffs before lifting the lid but Thumper prefers to just randomly pick one and guess. Maybe I should tell him it's called a Bunny "IQ" toy! Mao figured this toy out in minutes. He's even learning to put the lids back! All of the bunnies here at C&C are having a wonderful time with the Magnus Puzzle! Almost everyone learned quickly and when the buns are out for playtime, the Magnus is the first stop as they make their rounds! It is very well made and takes into consideration those delicate little mouths. C&C buns gives the Magnus a 24K rating! 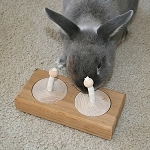 Not only did my bunny figure this out but he now uses one of the plugs to make his salad bowl ring. :) He has also lifts all the plugs until he finds the one that has the real treat in it. The other 3 have a few pellets. He's one smart bun! My bunnies loved this toy! 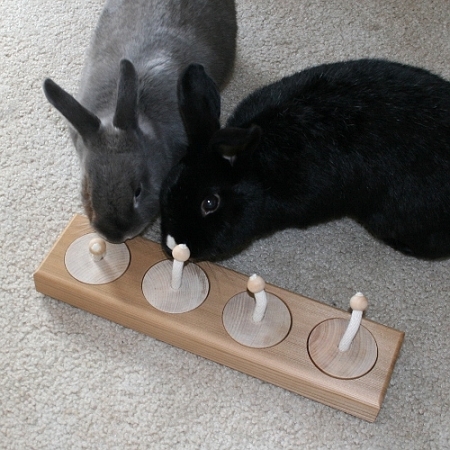 My bunnies love this toy! It took them a few days to figure it out. Now they have it down, and even when there aren't treats in it they love tossing the tops and making sure there aren't any treats left behind. One of my rabbits has learned a new tactic, she waits for the other one to lift the lid, then she goes in for the treat. Her poor boyfriend bunny never gets any treats! I'm going to get one more of these toys (probably the two lid version) so they can each have one to play with.